Detox Bath Salts: After an indulgent holiday season, doesn't this sound amazing? Copper Bottle Opener: A total necessity! 7-Day Stud Earring Set: I have these and LOVE them! Now I never have to wonder what earrings to wear with my outfit during the week. 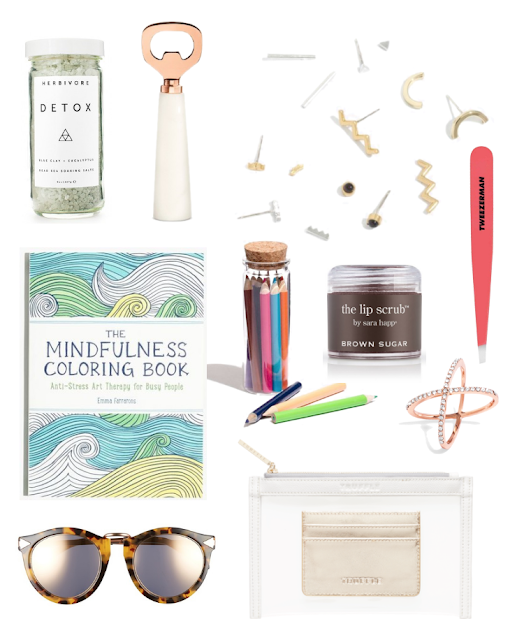 Mindfulness Coloring Book + Coloring Pencils: This is a smaller book which is perfect for a stocking stuffer and perfect to keep in your tote or desk drawer at work. Brown Sugar Lip Scrub: I don't really know what lip scrub is, but I'm intrigued! Tweezerman Tweezers: Because they are the best! X-Shape Ring: Such a simple way to make a statement. Karen Walker Sunglasses: A fun splurge...and worth every penny! Duo Clutch + Card Case: I've had my eye on the Truffle eye for a long time and love this new duo! Are you done with all of your shopping?